I’ve had two trips involving Savannah. One was intentional; I flew down for my sister’s wedding. For the other trip, I was actually trying to go to Charleston for work. 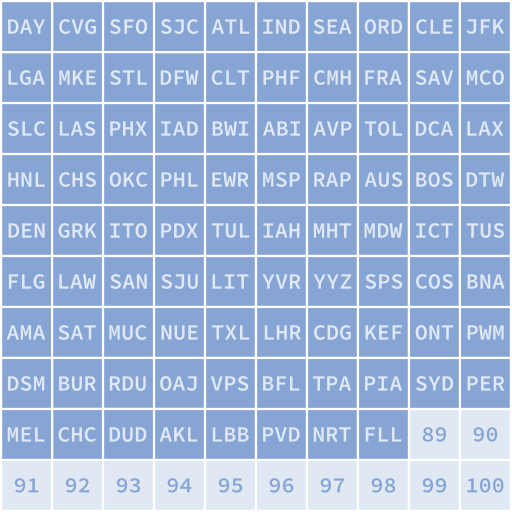 My employer has a contract carrier program in place – airlines bid for contracts for one-way trips between various city pairs. If flights are available on the contract carrier for that city pairs, I have to take it (with limited, justification-required exceptions). United was the contract carrier for DAY-CHS, so I booked my flight through them. However, this trip occurred in early 2012, not long after United had merged their reservation system with Continental’s, and they were having lots of issues with it. As a result, one of my flights was cancelled, and United was unable to get me to Charleston that same day themselves or on any other airline. However, they were able to get me on a Delta itinerary to Savannah (about a two hour drive away), and rebook my return flight from SAV so I wouldn’t have to do a one-way rental. The vast majority of my travel is within the United States, so Frankfurt remains the sole international airport in my flight log to date. 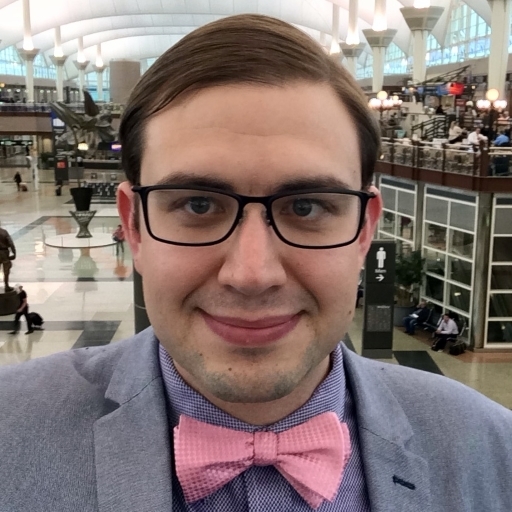 I’ve certainly been to others – I grew up with Air Force parents and have lived in both Germany and the United Kingdom, but both were when I was much younger, and I don’t particularly remember the airports. I think the biggest thing that surprised me was that, while it was a big airport, it wasn’t as big as I expected. It’s hard to remember, when I routinely fly through ORD and DFW, how big those airports truly are; they’ve become my normal “major hub” baseline, and I’m comparing everything to them. On my flight log, I’ve flown through San Jose twice –once unintentionally, and once on purpose. So really, the only notable thing about SJC for me is that it is one of my only single-use per trip airports so far – most new airports get at least two visits (once when I arrive, once when I depart). For both of the trips that I flew into SJC, though, I flew out of SFO. It’s certainly not my most memorable airport! Newport News has been relatively unremarkable for me; I visited it on a single trip in 2009 and haven’t been back since. However, it was the first place I’ve ever rented a car (up until that point, I’d been content to ride with coworkers on work trips, and I was 24 years old, so I hadn’t rented a car for personal use before). I’d been meaning to ride in a coworker’s rental car, but we were coming in on different flights, and his got cancelled. I got to have my first experience renting a car with very little notice, but it must have gone well, as I usually volunteer to be a driver on nearly all group work trips nowadays. As I left, PHF became the first airport from which I’d had a flight on a turboprop. 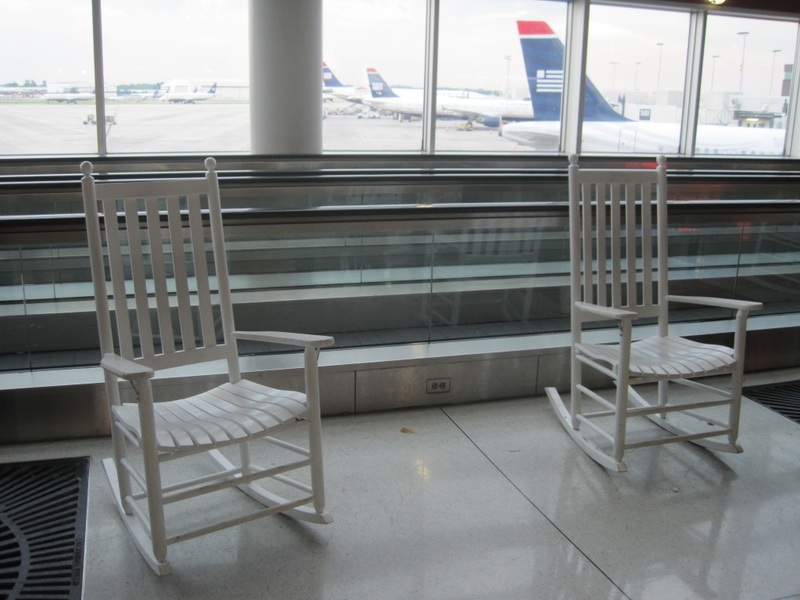 Charlotte is my most visited US Airways hub, and at first, I was often flying to it as a destination when I did a number of visits to some smaller towns in South Carolina. 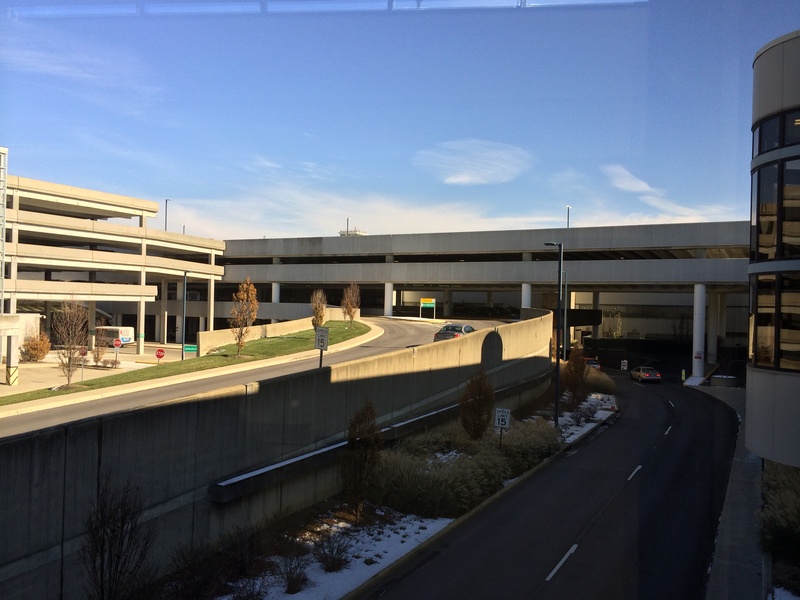 Recently, however, it’s only been a layover for me – and I suspect I’ll travel through it a lot more often now that US Airways is part of American Airlines, as this effectively gives me a new American hub serving Dayton. DFW is one of the first airports I became especially familiar with, and it’s now one of my favorite layover airports. Initially, I wasn’t using DFW for layovers at all; my new job had a contractor near Dallas that we had to visit frequently, and so I made quite a few trips to Dallas as a destination. American Airlines, with their enormous hub there, was the only airline to offer a direct flight there, and they were my employer’s preferred carrier for DAY – DFW. 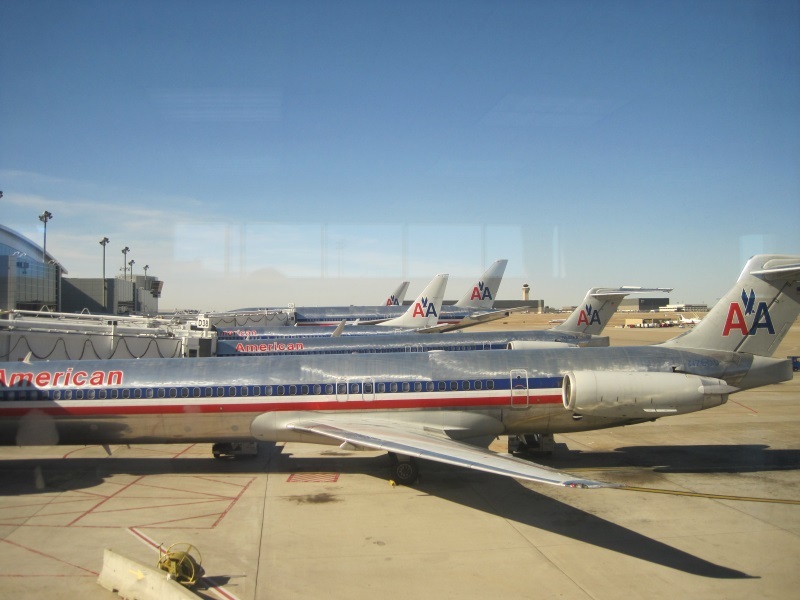 Thus, my first frequent flier elite status came with American Airlines’ AAdvantage program, and once I earned that, I began to focus on using American when I did have a choice of airlines. Since, at the time, American only served Dallas/Fort Worth and Chicago-O’Hare from Dayton, I ended up with DFW as a layover on a good portion of my westbound flights. 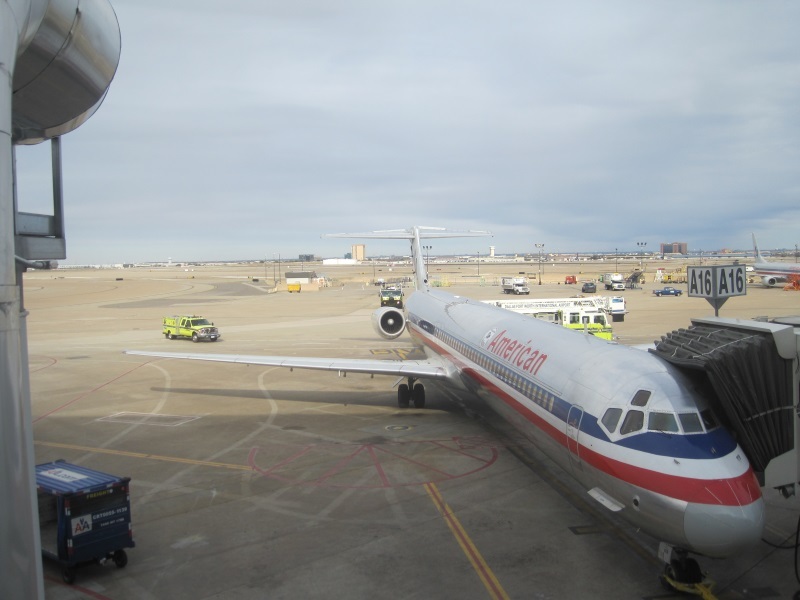 In February 2013, I had a trip to Austin, with a layover at DFW in both directions. On my outbound flight from DFW to Austin, our pilot came onto the intercom and nonchalantly informed us that the plane on fire outside the right windows is nothing to be alarmed about. He was absolutely correct; at DFW, they have a fire department aircraft trainer – what looks like an old aircraft, which can be set on fire so that the fire department can practice putting it out. I’ve seen these trainers at a number of airports, but I hadn’t yet seen one in use. On the return trip, I boarded what I believed to be my final flight of the day at DFW, expecting to fly back to Dayton. Instead, about a half hour into the flight, the lights flickered; a few minutes later, the crew informed us that the aircraft had experienced a generator failure, and while they had a backup, we were going to return to DFW for safety. When we landed and deplaned, I could see from the concourse that a number of DFW fire trucks had followed us back to our gate. I don’t know if the problem was worse than the crew let on, or if all the fire trucks were a precautionary measure, but at least I knew the fire crews were well trained.